RNA plays important roles in biology. Contrary to what we have already known about the protein structures, we know much less about RNA structures. The disparity is partially due to great difficulties in determining RNA structures. Our laboratory has developed a number of new approaches, methods and technologies to overcome technological barriers. Those include small angle X-ray scattering1-3, position-selective labeling4 and micron/nanocrystallography using X-ray free electron laser5. Those new tools allow us to study the problems that would otherwise be challenging using existing approaches. I will give two examples of applying these tools to study important structural biology problems. They are the structural basis for the HIV-1 viral recognition of its own mRNA for nuclear export1 and the switching mechanism of the adenine riboswitch. At the end of my talk, I will also discuss some of continuing developments in several fronts in our laboratory. 1 Fang, X. et al. An unusual topological structure of the HIV-1 Rev response element. Cell 155, 594-605, (2013). 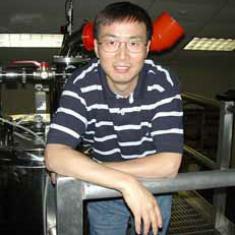 2 Fang, X., Stagno, J. R., Bhandari, Y. R., Zuo, X. & Wang, Y. X. Small-angle X-ray scattering: a bridge between RNA secondary structures and three-dimensional topological structures. Current opinion in structural biology 30, 147-160, (2015). 3 Zuo, X. B. et al. Solution structure of the cap-independent translational enhancer and ribosome-binding element in the 3 ‘ UTR of turnip crinkle virus. Proc. Natl. Acad. Sci. U. S. A. 107, 1385-1390, (2010). 4 Liu, Y. et al. Synthesis and applications of RNAs with position-selective labelling and mosaic composition. Nature 522, 368-372, (2015). 5 Stagno, J. R. et al. Structures of riboswitch RNA reaction states by mix-and-inject XFEL serial crystallography. Nature 541, 242-246, (2017).